Australia and New Zealand seem to be the hot spots for genre fare these days. With films like THE BABADOOK, WOLF CREEK 2, and HOUSEBOUND, this particular geographic location appears to be overflowing with talented filmmakers who are ready to scare your shorts off. One such director is Stuart Simpson, his two previous efforts were far different in tone to the film he most recently unleashed, CHOCOLATE, STRAWBERRY, VANILLA. The title is misleading and the film is too. It balances the fine line between humor and horror, mostly of the psychological variety. The lead character Warren is portrayed by Aussie actor Glenn Maynard who convincingly channels several different personalities as we learn more about him. I wouldn’t classify this as a straight up horror film but it’s quite the character piece and the unhinging of the lead character works amazingly. 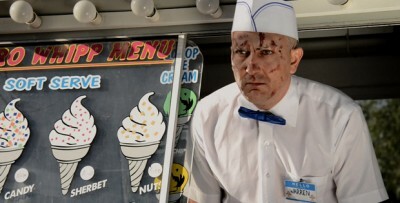 Warren Thompson (Glenn Maynard) is an awkward young chap who drives an ice cream truck. He lives a pretty simple existence, worshipping the likes of Clint Eastwood and Katie George (Kyrie Capri). We all know Eastwood but Katie is a local celebrity who stars on Warren’s favorite television show. To him, Katie is shear perfection, he collects videos, magazines, and anything else he can find featuring the lovely star. He soon learns her show will be filming near him so he parks his vehicle by a nearby park in hopes she may come by. Sadly, in that particular area there’s no shortage of scumbags who loiter around, causing him nothing but grief. He puts up with a violent pimp, druggies, and punk kids for days until the unimaginable happens: Katie George comes to get ice cream. After their first meeting, he buys a video camera so he can chronicle the momentous day as well as subsequent days until she comes back for another scoop. He can’t believe this is happening and she does stop by to visit him on several occasions. His life is changing for the better and things couldn’t be more perfect for him, or can they? 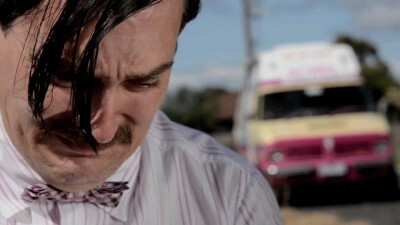 Warren will have to battle the demons inside his head if he’s to win the war against his sanity. The film manages to be gripping right out of the gate. It has this dark comedy quality that’s more prominent in the first half of the picture. It moves along like this for a portion before ramping up the stakes and delivering a strong and shocking finale. While the script by Addison Heath is quite solid, it’s the performance by Maynard that drives this film clear over the edge. The character is a simple, quirky man who lives his life alone. He has these seriously uncomfortable confrontations with other characters, only because he seems to have a social anxiety. He has dreams of being a Clint Eastwood like hero and Maynard effortlessly switches gears and becomes a Western gunman. The character morphs throughout the picture until he becomes unrecognizable and Maynard’s performance is one I’ll remember for quite a long time. While he may be the star, his supporting cast is equally as good. Kyrie Capri is not only breathtaking, the sweetness of her character is a driving force in the film. Aston Elliot who plays the pimp who harasses him is also quite memorable. 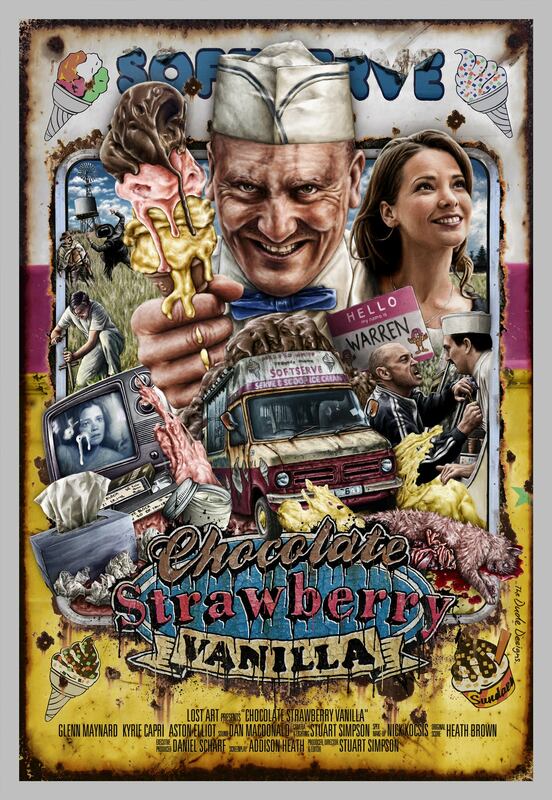 CHOCOLATE, STRAWBERRY, VANILLA is a fantastic character driven, dark comedy with a career defining performance by Glenn Maynard, an actor I’ll be expecting to see great things from in the future. Stuart Simpson has been an interesting talent to watch and with this film, he proves he’s able to play in the big leagues. Where this film takes him will be a journey worth paying attention to. It’s funny, uncomfortable, and mildly disturbing, qualities many films will strive to achieve only to crash and burn. C.S.V. is everything it tries to be and more, a hugely successful film with a voice all its own. ***** (out of 5).